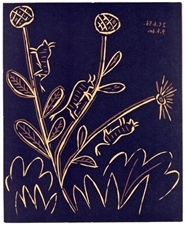 An avid printmaker always exploring new techniques, Picasso experimented with linoleum cuts in the late 50's and early 60's. 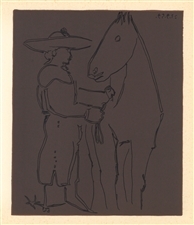 The original Picasso linocuts were hand-signed and sold by Gallerie Louise Leiris in an edition of 50. 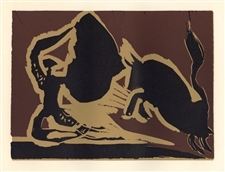 However, the original linoleum block plates were destroyed during the process of printing, because Picasso carved ever deeper into the block for the application of each separate color, so after the initial printing run they could not be used again. 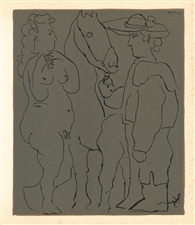 In 1962 Picasso consented to a larger edition of reduced-size replicas, which were beautifully printed in West Germany and published in America and France. This 1962 edition has become quite scarce as collectors appreciate the quality of printing -- much superior to the reprint editions which followed in later years. 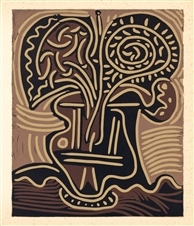 We're proud to offer this exquisite and affordable 1962 version of Picasso linocuts. 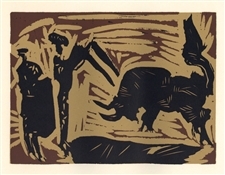 Pablo Picasso linocut "Two Satyrs and Goat"
This impression from the sought-after 1962 edition (published by Abrams) was done on heavy wove paper with a richly textured printed surface. The sheet measures 12 x 14 inches (307 x 358 mm) and the image size is 10 1/2 x 12 3/4 inches (270 x 325 mm). Not signed. Pablo Picasso linocut "Woman at the Window"
This impression from the sought-after 1962 edition (published by Abrams) was done on heavy wove paper with a richly textured printed surface. The sheet measures 12 x 14 1/4 inches (307 x 360 mm) and the image size is 10 1/2 x 12 3/4 inches (270 x 325 mm). Not signed. 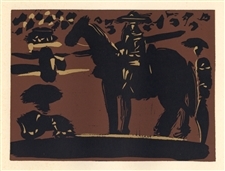 Condition: there is foxing in the margins but the linocut image is good with strong, fresh color. 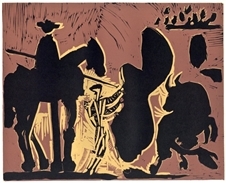 Pablo Picasso linocut "Bacchanal with Black Bull"
This impression from the sought-after 1962 edition (published by Abrams) was done on heavy wove paper with a richly textured printed surface. The sheet measures 12 x 14 inches (307 x 357 mm) and the image size is 10 1/2 x 13 inches (270 x 330 mm). Not signed. 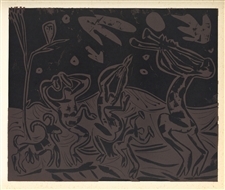 Pablo Picasso linocut "Bacchanal with Four Clouds"
This impression from the sought-after 1962 edition (published by Abrams) was done on heavy wove paper with a richly textured printed surface. The sheet measures 12 1/2 x 14 1/2 inches (318 x 365 mm) and the image size is 10 1/2 x 13 inches (270 x 330 mm). Not signed. 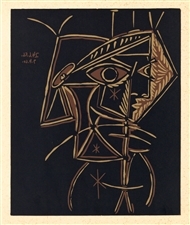 Pablo Picasso linocut "Female Head with Necklace"
This impression from the sought-after 1962 edition (published by Abrams) was done on heavy wove paper with a richly textured printed surface. The sheet measures 12 1/2 x 14 1/2 inches (318 x 365 mm) and the image size is 10 1/2 x 8 3/4 inches (270 x 225 mm). Not signed. 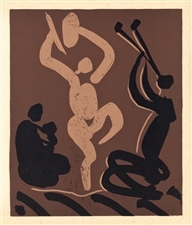 Pablo Picasso linocut "After the Vintage"
Pablo Picasso linocut "Three Women"
Pablo Picasso linocut "Two Women at the Window"
Pablo Picasso linocut "Bacchanal with Bull"
This impression from the sought-after 1962 edition (published by Abrams) was done on heavy wove paper with a richly textured printed surface. The sheet measures 12 x 14 inches (307 x 358 mm) and the image size is 10 1/2 x 13 inches (270 x 330 mm). Not signed. 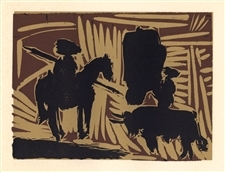 Pablo Picasso linocut "Picador and Bull"
Condition: there is foxing in the margins but the linocut image is good with strong, fresh color. There is a scratch near the top of the image, but it is difficult to see from most angles. The first photo is a close-up of the image; the second photo also shows some of the margins. 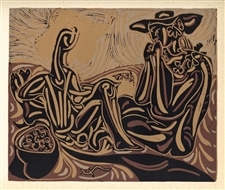 Pablo Picasso linocut "Before the Goading of the Bull"
Pablo Picasso linocut "Reclining Woman and Guitar-Playing Picador"
Pablo Picasso linocut "Reclining Woman and Picador Eating Grapes"
Pablo Picasso linocut "Picador Goading Bull with Matador"
Condition: there is foxing in the margins. The first photo is a close-up of the image; the second photo also shows some of the margins. 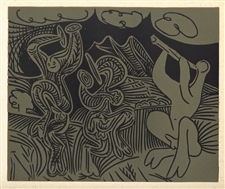 Pablo Picasso linocut "Female Bust"
Pablo Picasso linocut "Dancing Satyrs and Flute Player"
Pablo Picasso linocut "Bacchanal with Pair of Lovers and Owl"
Pablo Picasso linocut "The Broken Lance"
Pablo Picasso linocut "Two Women"
Pablo Picasso linocut "Reclining Woman and Picador with Guitar"
Pablo Picasso linocut "Picador Goading Bull"
Pablo Picasso linocut "Guitar Player and Seated Woman"
Pablo Picasso linocut "Bacchanal with Mother and Child"
Pablo Picasso linocut "Picador and Matador"
Pablo Picasso linocut "Picador and Fleeing Bull"
This impression from the sought-after 1962 edition (published by Abrams) was done on heavy wove paper with a richly textured printed surface. The sheet measures 12 1/2 x 14 1/2 inches (318 x 365 mm) and the image size is 6 1/2 x 8 3/4 inches (165 x 225 mm). Not signed. Condition: there is foxing in the margin near the edges of the sheet but if properly matted this will not be evident. The linocut image is good with strong, fresh color and the margin around the image is clean. 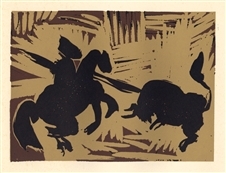 Pablo Picasso linocut "Bull Charging a Capa"
Pablo Picasso linocut "The Goading of the Bull"
Pablo Picasso linocut "Mounted Picador"
Pablo Picasso linocut "The Banderillas"
Pablo Picasso linocut "Mother, Child, Dancer and Flute Player"
Pablo Picasso linocut "Picador, Woman and Horse"
Pablo Picasso linocut "Flower Vase"